The Career Tree depicts a plant, so it appeals to my innate pro-plant bias. (And it shows the WHOLE plant, including its roots – about which, more near the end.) The image also validates my own career choices, which led me away from the main rungs of the academic ladder and (eventually) into my current position as “Non-profit sector, executive director”. But enough of me. 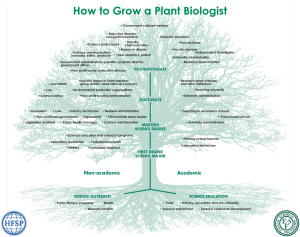 The Career Tree is appealing because it is a visually compelling illustration of the ways in which science and science training should be organized if we want to create a diverse and thriving professional ecosystem for plant scientists – and for plant biology. I could go on about this for a while, but I’d like to focus on just a couple of aspects: inputs and outputs. In terms of inputs, those of us involved in educating and training the next generations of plant scientists ought to be shouting from the treetops that PhDs and Master’s degrees in science can open doors to a world of professional opportunities. Surely, if we can convince school students and undergraduates that a PhD in plant science could lead to advocacy work in government, science writing and editing gigs, corporate opportunities, and even leadership positions in non-profits – as well as careers in academia – the whole field will be more appealing. More practically, despite the zeitgeist that seems to dominate in many graduate programs, it is not all about preparing wannabe PI clones: the data clearly indicate that in the biological sciences, only one in six PhDs find themselves with a full-time permanent job among the branches on the right hand side of the tree. If we are lucky, careful, and vigilant, then we will seek out and make the most of opportunities to develop skill sets and connections that will propel us in different directions. Contacts at companies. Well-honed public speaking skills. The capacity to get our thoughts across succinctly and compellingly in writing. And so on. In many places, however, these skills and connections are picked up by graduate students on an ad hoc basis. Although certain attributes may be more important in one venue versus another, there are core skill sets that are more or less universally applicable. Finding ways to ensure that developing these skills is baked into graduate programs and postdoctoral positions makes very good sense. 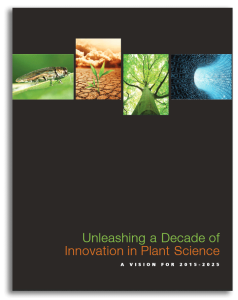 But beyond common sense, and as clearly articulated in the recently published report Unleashing a Decade of Innovation in Plant Science: A Vision for 2015 – 2025, such “T-training” is a vital component in preparing the next generations of plant scientists for the challenges we face. Surely it is in everyone’s best interests to make sure that we nurture future leaders and ensure that plant science practitioners are well equipped to succeed in a range of workplaces. Those that climb the rungs of the Career Tree should be encouraged to step off at whatever point and in whatever direction they choose. They should also have a reasonable chance at a satisfying career in whatever science-related occupation they find most interesting, compelling or accessible. If you are in charge of graduate or postdoctoral training or in a position to influence those that are, then please help them to find ways to incorporate active learning and development of “soft skills” along the way. If you’re interacting with undergraduates or students in middle and high schools, “talk up” the range of careers in which you’ve encountered happy and fulfilled scientists. If you’re a student or a postdoc, seek out opportunities to broaden your networks and make new connections – and work within your institution to help increase appreciation for “career diversity” and to improve the availability of the tools that are needed to achieve it. And while you are at it, please be sure to pay attention to the roots of the Career Tree, too. Because, as is implied in the image above, if we fail to nurture K-12 education and public outreach in the plant sciences, we risk destabilizing our entire discipline. Great post Dr. Taylor. I agree with a lot of it. I hope that broadening training is embraced- or that wherever any plant scientist ends up, it’s accepted by the academia. The prevailing culture in much of academia still seems to be one of insularity and that the traditional path is the only one that ‘counts’. I hope part of ASPB’s lobbying efforts with funding agencies is to trace where trainees in labs end up- whether academic or not- and have that count in favor of PIs who train people who go on to do good work in any field. Really a Great Post. I am also fully agree with Dr. Taylor views on career tree for Plant Scientists. 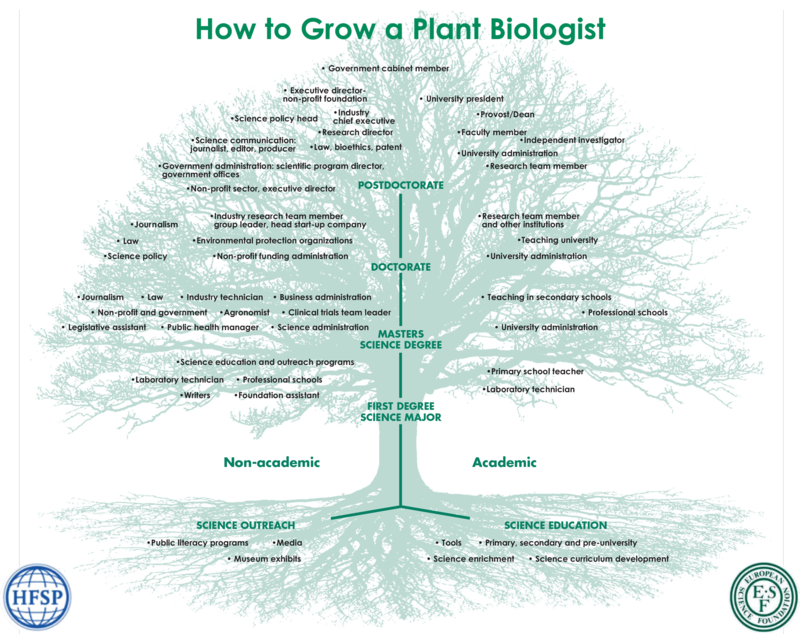 I think some where, it would require more ignition and boost at academics level in order to understand the great career of Plant Biologists. Like all the scientific research area, we should realize our contribution as a Plant Scientists and its our great responsibility to disseminate this message to youngsters in this field. Many thanks for taking time to share your feedback, Ian and Sunita; your comments are well taken. Although the perspective is not universal (yet…), I am encountering an increasing number of people (in government, in leadership postitions in academia, and certainly in companies) who recognize that “career success” for any given trainee can and should be broadly defined.